The video begins by quoting President Obama when he mentioned that the United States could quickly dispose of Iran’s military apparatus, should the U.S. need to deploy the military option to stop Iran from becoming armed with a nuclear weapon. “I do not want to say anything more in this regard. Our predecessors used to call such statements, ‘boasting among strangers,’” Khamenei adds, as another image is shown of an individual pulling a weapon out while standing next to two men who appear to be a portrayal of Americans in cowboy hats. The video then highlights Iran’s military arsenal, and includes a short animation of ships storming a “USS NAVY” warship, while also showcasing its homemade tank, and a U.S. drone that Iran claims it has reengineered for its military’s use. Next, the video flashes to a photo that shows two missiles along with a Hezbollah flag and a photo of its leader, Hassan Nasrallah. “We neither welcome nor begin any war,” the Ayatollah’s voice continues, while an animation appears of an Iranian missile being fired at U.S. troops in Afghanistan. “They must know that should any way break out, one will emerge humiliated out of it,” he adds. “One will emerge humiliated out of it,” and it “will be invading and criminal America,” Khamenei concludes, as a photo is shown of American soldiers carrying a coffin draped with an American flag. 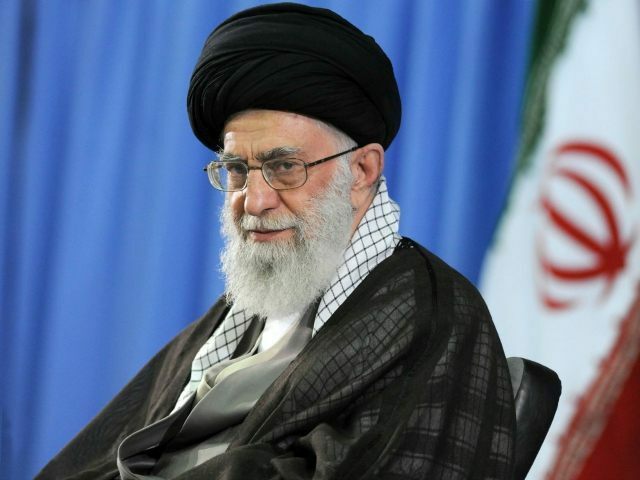 Khamenei’s provocative video comes just days after he threatened to annihilate Israel within the next 25 years. “Firstly, you will not see 25 years; God willing, there will be nothing as Zionist regime by next 25 years. Secondly, until then, struggling, heroic and jihadi morale will leave no moment of serenity for Zionists,” the Iranian dictator tweeted Wednesday. The same day, the Mullah pledged that Iran would never again negotiate with the “Great Satan” America following the nuclear accord between world powers and Tehran.